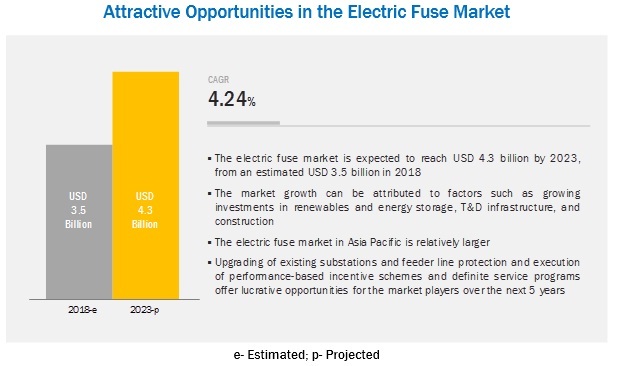 [143 Pages Report] The global electric fuse market is projected to reach a size of USD 4.3 billion by 2023, at a CAGR of 4.24%, from an estimated USD 3.5 billion in 2018. This growth can be attributed to growing investments in renewable and energy storage, increasing investments in T&D infrastructure plans, and revival of investments in construction sector. By type, the power fuse & fuse link segment accounts for the largest contributor in the electric fuse market during the forecast period. The power fuse & fuse link segment of the electric fuse market is driven by the rising demand for medium voltage fuses in T&D networks, transformers, circuit and motor protection, along with industrial applications and renewable energy generation and distribution. These types of electric fuses are made of an alloy of silver, copper, or tin, and the chamber of fuse links is generally filled with boric acid, as it has low refilling cost and coordinates better with transformers and distribution networks. The fuse links are designed with high rupturing capacity so that the current flows in specific standards. The utilities segment is expected to be the largest contributor during the forecast period. The demand from utilities for electric fuses is frequent because of their short life span and low replaceability cost. According to the EIA, in the US, the investments on circuit protection equipment have risen by 69% over the last decade, thus creating opportunities for the usage of electric fuses by the utilities. The rising safety issues related to photovoltaic systems and distributed energy resources are other factors driving the demand for electric fuses from the utilities. The utilities operate at a high voltage level at 11 kV, 22 kV, and 33 kV, thus medium voltage electric fuses are preferred. Electric fuse market has been analyzed with respect to 5 regions, namely, North America, Europe, South America, Asia Pacific, and The Middle East and Africa. The market in Asia Pacific is estimated to be the largest market from 2018 to 2025. China and India are among the largest markets in the world and also has rising per capita consumption of energy due to increased industrialization and manufacturing. The countries have seen rapid infrastructure development during the past years. The major players in the global electric fuse market are Schneider Electric (France), Siemens (Germany), Mersen (France), ABB (Switzerland), Eaton (Ireland), Bel Fuse Inc. (US), Littelfuse (US), Legrand (France), S&C Electric Company (US), G&W Electric Company (US), Schurter (Switzerland), and Hubbell (US). In January 2019, Mersen announced the launch of Class RK1 Reducer Fuses product series. The new developed product suits well to manufacturing facilities, and has high reliability performance, durability, and arc flash mitigation features to distinguish it from other fuses. The company is determined to expand its product portfolio, through such developments. In September 2018, Littlefuse launched a new series of PICO 242 Series Hazardous Area Barrier network fuse that prevents fires and explosion in critical situations. The fuse has quality to prevent the circuit from overheating and thus minimizes the risk of short circuit. The company intends to strengthen itts product portfolio with such development and launches. In July 2018, Bel Fuse launched a new few series 0ADHC, which is a type of power fuses. The new power fuse series, is fast acting, ceramic tube fuse, having compact dimensions. The 0ADHC series has high breaking capacity, protecting digital and analog multimeters. The report identifies and addresses key markets for electric fuse, which would help manufacturers review the growth in demand. The report addresses the market share analysis of key players in electric fuse market and with the help of this companies can enhance their revenues in respective market. The report provides insights about emerging geographies for electric fuse and hence entire market ecosystem can gain competitive advantage from such insights. This study involved 4 major activities to estimate the current market size for electric fuse. Exhaustive secondary research was done to collect information on the market and peer market. The next step was to validate these findings, assumptions, and market sizing with industry experts across the value chain through primary research. Both top-down and bottom-up approaches were used to estimate the total market size. Thereafter, the market breakdown and data triangulation was done to estimate the market size of the segments and sub-segments. This research study involved the use of extensive secondary sources, directories, and databases, such as Hoover’s, Bloomberg BusinessWeek, Factiva, and OneSource, to identify and collect information useful for a technical, market-oriented, and commercial study of the global electric fuse market. The other secondary sources included annual reports, press releases & investor presentations of companies, white papers, certified publications, articles by recognized authors, manufacturer associations, trade directories, and databases. The electric fuse market comprises several stakeholders such as end-product manufacturers, transmission and distribution operators, residential and end-users in the supply chain. The demand side of this market is characterized by its end-users such as commercial, residential, industrial, utilities, and transportation. The supply side is characterized by advancements in protection technologies such as comprehensive and fast reacting products and increased emphasis on electric fuse operational lifetime. Various primary sources from both, the supply and demand sides of the market were interviewed to obtain qualitative and quantitative information. The key players in the industry and market have been identified through extensive secondary research, and their market shares in the respective regions have been determined through both primary and secondary research. After arriving at the overall market size-using the market size estimation processes as explained above-the market was split into several segments and sub-segments. To complete the overall market engineering process and arrive at the exact statistics of each market segment and sub-segment, the data triangulation and market breakdown procedures were employed, wherever applicable. The data was triangulated by studying various factors and trends from both, the demand and supply sides, in the commercial, residential, industrial, utilities, and transportation. Asia Pacific, North America, Europe, The Middle East & Africa, and South America. This research report categorizes the electric fuse market based on product type, end-use and region.